Sometimes I worry about us woodworkers. We tend to go off to our shops and isolate ourselves from the world. (Did you hear about the guy who always stayed at home because he didn’t want to have to kiss his wife goodbye?) As a follow-up to our safety week and as a public service, I call attention to a bulletin issued last week by the nationoal Center for Disease Control and Prevention in Atlanta. Use this information to stay safe and keep buying and using your woodworking tools. 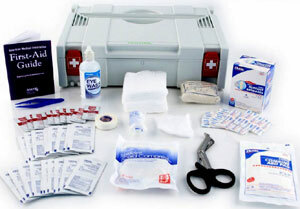 The Festool Contractor’s first aid kit may not have zombie antidote, but it’s got everything else you might need! The CDC issued guidelines to follow in case of a Zombie Apocalypse. (You may think I am making this up, so here is the actual real link). This warning really hit home with me since my shop is in the back yard in the deep woods so to speak, and it can get really spooky out there at night. After dark with the lights on in the shop, you cannot see what is going on outside, and when you get absorbed in a delicate little dovetail joint, the whole world could end around you and you would hardly know it until it was too late to do anything about it (as if you could). Until now I had not worried about what steps I would need to take in case zombies (the technical term for the condition is Ataxic Neurodegenerative Satiety Deficiency Syndrome) showed up at the shop. 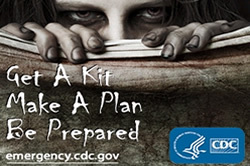 For instance, the CDC recommends that you set up a meeting place outside the home so your family can rendezvous and escape together to a zombie-free refugee camp. They post a list of supplies to take with you including water and food and a first aid kit, though they do admit that once bitten the first aid kit will not be of much use. We agree with the CDC. What the CDC has left out though, are defensive tools to protect yourself during a zombie attack. Generally woodworkers are particularly well-equipped to protect themselves with devices that are already found in nearly every woodworking shop. My lathe skew chisel (properly sharpened), for instance, with its slanted blade and sharp point would be very effective as a zombie defense. My battery powered drill (I will need to keep the batteries charged better than I normally do) with a two inch spade bit would also be helpful. Oh wait, how about the drill mounted three inch hole saw – I think that would be better. The battery powered reciprocating saw is an awesome tool, effective in many situations where no other tool will work. And if you have ever caught your finger in one of those Japanese cut-off saws, you will recognize what damage that thing could do when properly applied to larger fleshy appendages. (As in most woodworking operations, having this saw cutting on the pull stroke makes it much easier to use when you are in a rush to finish a project.) Last but not least, is my chain saw. I prefer a 20 inch blade to give me a little more depth of cut, and you don’t need a really big saw – too heavy to lift to shoulder height on a continuing basis. Just make sure it has the proper gas and oil mix so you can get it started easily. When you need it, you need it quick. Get your zombie apocalpyse ‘Go Bag’ ready! I am going to recommend to the store that we put together a Highland Zombie Apocalypse Preparedness Kit. It should include all the materials recommended by the CDC, plus the things I have suggested here. 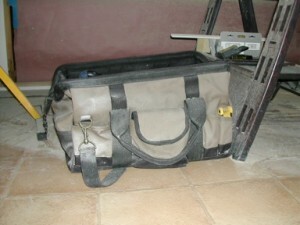 I think we will put it in a big tool bag so you can grab it and go on short notice. The problem with that is you will not be able to use the tools from the Kit without taking a chance on missing some of them when you have to leave in a rush. Just use them and put them back in the Kit as soon as you are done. We are open to suggestions here people. Send us your ideas and perhaps you will see them incorporated into our Kit. Now go fuel up the chain saw. Be prepared!! Stay safe. Keep your brain. Hog off wood AND still get a good surface from the same tool?? Is this possible? I’m thinking a Paslode framing nailer with the safety disabled would give you better standoff distance. Plus you could use it fortify your barricades. I have heard that more accidents happen with a box cutter than any other tool. A box cutter or a chisel could be a good defensive tool. By the way – this is really funny. Well, it’s not exactly a hand tool, but if you don’t pack a chain saw, I figure you’re a goner. Why are zombies always depicted as having bad teeth and dirty fingernails? Please include a toothbrush, toothpaste, and nail clipper in your kit. I suggest extra table saw blades. You could whiz them like Frisbees thus decapitating the zombies. I’m wondering how SawStop tools would perform in such dire circumstances. After all, I wouldn’t want to cut myself while I was lopping them in two. I figure to arm myself with a plasma cutter and a picture of Lady Gaga! Maybe a Gransfors Bruks Competition Throwing Axe would come in handy. Besides keeping your distance it would be handy for firewood if you had to vacate your shop. You guys don’t get it do you, there will be no power so no power tools. This life but definitely not as you know it. Subject: FW: What’s in your Zombie Apocalypse tool kit? I really need this kit, I must have it as soon as possible. See, I really wasn’t joking around about the Zombies. And what a perfect father’s day gift. Just think, I will be able to sleep through the night again. hi you had better get two sets of tools that way you’re not running around trying to find your zombie bag, like you dont have two of everything already. a real sharp Marking knife could cut a zombie’s throat, I think that would do the trick. A 12 gauge with loads of shells. Perhaps not the most used item in a guy’s shop but handy for Zombie breakouts. It’s hard to reload an ax once thrown. Thank you. Thank you. Thank you. Awareness is the first step toward preparedness and i am glad you are spreading the word. Most of us are woefully unprepared for zombie attack and post-apocalyptic conditions. For those who have not put enough thought into this very serious topic the following just might help save your life. Being an old guy I do not relish hand to hand combat with a Zombie. So, I’m sorry but woodworking tools don’t do it for me. If the CDC is serious a trip to my local sporting goods store for a shotgun seems to be in order. Hand to hand, how about a Woodman’s Pal or a good sharp Axe. Most people may not have one of these in their tool kit but since I have worked in some bad areas of large cities I try to have a firearm handy. Box cutters are great if you want to hurt yourself but as far as Zombies go, who wants to get close enough to use it. Also make sure any saw-weapons are battery operated. It could be embarassing as well as deadly if you accidently pull the plug on your corded tool at the wrong time. Get a gallon of super Glue and make a big cicrle around your shop and the zombie’s won’t get in to get you. I’d pack tools sufficient to build shelter in a remote location, such as an axe and a saw. I’d also pack a hammer, nails, gorilla glue, and duct tape. My bugout bag also includes a multi-tool, a Swiss army knife, and a machete. Don’t forget 30 days worth of prescription meds and a water purification kit. With twisters, hurricanes, and earthquakes happening around the world, I don’t believe it’s just survivalists any more who have bugout bags ready to go in case of emergencies. I like my boatbuilding/timber framing slicks. Japanese style are wicked sharp. Western style are just plain heavy and mean. I say just make Phil Colson stand in front of your shop and the Zombies wouldn’t even show up. If you have one of those vacuum packers for the kitchen a lot of stuff can be package that way for long periods of time. Strike anywhere matches stored in those old style moisture proof metal match containers vacuum packed would be a good idea. Flints and strikers would also be a good idea. If you have the old style small hand drill and one of the old style braces and bits to go with them it would beat a battery operated drill any day. The only other way to charge batteries would be to build a small solar panel and hope there’s some sun. A “Crank Style Radio” would also be a good idea. A set of chisels, including some big firmer style chisels would be good, you can find them at a lot of swap meets. I would get some thin leather to make covers for the chisels so they do not cut the packages you put them in. Again I would vacuum package them. Also vacuum packing a few different grit diamond stones or any kind of water stone. Then you’re not worried about carrying oil for the stones. There are some kinds of cat litter that is heavy on Desiccant which when packaged in cheese cloth or other kinds of porous cloth and can be thrown in with any thing that is not package to prevent moisture. Throw some vacuum packaged packs of different kinds of nails and different sizes of screws. Galvanized or stainless would be a good choice. A few folding saws would be good. There are small camping axes that would fit in the pack also. Take some of those shavings you get from planing with hand planes etc. and vacuum pack those they will make good fire starting materials. Don’t forget some of the newer bug sprays that go on dry they work great and you are not dripping. CVS has a good emergency first aid kit for about $20.00, well worth it and you can add to it what you want. Again if you can vacuum pack it do it. You can go to a place on-line and find some large knives for about $10.00 that will be good enough for the kit and are almost indestructible. Just about anything like rope, nylon or para-cord would also be good. Hope some of this helps. Also some purifying pills for water would be good. If any of you carry, you know what you should take with you. I probably could go on but these are just some suggestions. Oh!!! throw some of those $4.00 blue drop cloth’s in the trunk of the car or roll them up like sleeping bags. A couple of those mylar blankets would also be good. I dont think the 1st blog about the paslode with the safety disabled is a good one – would’nt the nails have to be silver – or am I all mixed up between Vampires and Zombies ! will garlic and a cross work for both ? In case you folks forgot your zombie 101 course, it’s the head stupid! I’m looking for that ultimate zombie jig that will take care of the undead. Yeah, and we thought tear out was a problem…. I’m going to start my zombie toolkit with the Auto Assault-12 (AA-12), an automatic 12-gauge shotgun that can fire 300 rounds per minute and is recoilless. Add a SOG FO2T Battle Axe, a few M18 Claymore Mines (if the zombies are in pieces, they can’t attack you can, they) strategically set up around my shop and I can continue my woodworking in peace. Sharp marking knife,sharp chisels,an axe,and a long scratch awl,then bring on those #$@%ing zombies. As long as those tools are nice and sharp,the zombies don’t stand a chance. You have got it all wrong. The only ones that should be allowed to fight zombie’s with chisels and saws, are those that have mastered hand tools. All power tool junkies should have a .50 BMG semi automatic. Zombie fighting can be exhausting so I suggest taking a nap before they arive so you will be well rested. IS IT APRIL 1st AGAIN ? ? ? ? ? ? ? Yup! I have LOTS of AMMO loaded just for this situation! I agree, Jim. a shotgun with double BB or even #6 works great! Guess I might have to consider loading some more though, might run out. I only have 10 guns, might have to buy a few more too. Search YouTube for the AA12 shotgun. Ultimate. Zombie. Protection. I figure that the most dangerous weapons would be to offer the zombies a credit card with no credit limit, a sub prime mortgage, and the assurance that social security will be there for them. My x wife’s birthday is October 31, So I will ask her to park her broom close to the door so we can get a head start when the rush starts. Oh, do zombies fly? A good raking light off a highy sheened French polished table top will blind them. Old bandsaw blades wired together will make great concertina wire to entagle them. Then turn the table saw around and finish them off will a furious volley of kicked back boards. Never mess with a man’s workshop. Thats good advice even for the undead. Since we’re talking about shooting dead people in the head…a simple .22 LR rifle or pistol…the ammunition is light and lots can be transported…but really, zombies are a problem in the real world? I have enough challenges with my jointer…I don’t worry at all about dead people walking…though I did laugh at that Zombie movie with Jesse Eisenberg…Zombieland….funny movie. Couldn’t read all of the comments but for sure I’ll be packing my 24v DeWalt sawsall with a few extra batteries and a bunch of Magna 12″ demo blades. There! Take that! There won’t be any power so it’s best to use the power tools to build defenses in advance. Like a hurricane proof fence or a retractable attic access. Then when ZEKE gets here, head to the garden shed for PRE-sharpened implements. I personally like a 6 foot, weighted, extra sharp tile scrapper. Gentlemen, head shots are the key. Most of our chisels and turning tools will get you in too close, allowing them to gang up on you. Slicks wood be nice, since a slashing cut can break bone; tang mounted of course. And Benny, garlic and crosses only work on Vampires. But I have to go with the shot gun guys, get as many loads as you can carry and a Taurus 410 pistol as a final weapon. Otherwise go with God and I’ll meet you in the refugee camp. I think I would start with a wide assortment of Lie-Nielsen bench planes and block planes, a set of bevel edge chisels in the leather roll, shoulder planes, the dovetail and carcass saw, tenon saws, fishtail chisels, and an inlay set. Yes, that should be started on a good set of defensive weapons. Please have those in the mail to me by the end of the day. Thank you. As a last resort, the good ol’ .45. Why a .45? Because they don’t make a .46. Hmm, seems like a great excuse to get one of those gas or diesel driven, trailer mounted air compressors. Combine with a HVLP (or HVHP?) and a 55 gal drum of your favorite flammable thinner, and you have a nice little flamethrower. Should be able to simultaneously power one of those potato air cannons, though you might want to load it with molotovs, nails, cut-offs, etc. and a big, heavy piece of scrap wood with a dozen or so 4″ spikes sticking out is good if they get too close. Finally, surround your home and shop with some really nice decking. Then when the zombies come, cover the decks liberally with all those shavings you have. Those things are slippery!! I’m an American male but I guess I missed out on the red-blooded part: guns scare the bejesus out of me. I’ll have to rely on my 16″ Brazilian machete, my 12″ Malaysian heavy duty pointed parang, and my Indonesian ax with the 10″ blade. Wish they’d warned us a couple months earlier so could have brought by my 20″ weighted tip cane cutter from Malaysia. Sigh. The blades I do have are hanging on the window next to the woodworker’s bench I inherited from my grandfather through my father. Not only will I defend it to the death but it’ll a convenient barricade. A tip for other gun-phobes out there: wrap your babies in oil soaked light cotton (synteddy will not do) before sheathing them; rust may never sleep but they’ll be clean and shiny for a couple years. You wouldn’t want to give any of your family tetanus when you miss the undead ’cause tetanus shots are likely gonna be hard to find. Now all I gotta do is find some time without a project in progress or a honey-do to sharpen my babies. Don’t forget your hockey mask to use with that chainsaw. Don’t want any blood borne pathogens to escape into the air. I think if zombies start showing up then I am in the market for a BAR (and I don’t mean a place to drink). I cant believe no one has mentioned the Stanley FatMax FuBAR! They even do “Emergency Response” versions Like the Forcible Entry version with 30″ of zombie splattering forged steel. I have 6 lathes in the back shop, where I am late at night. Never turned a Zombie before, might take special jigs. But I can practice on 6 at a time. Hi folks, Excellent ideas. I would add in: 375 magnum, 410 shotgun, extra saw blades to be used like a frisbee, (practice abit) a 3# mall for head mashing, and lastly, a machete, very sharp, but with rust and a deadly toxin for immediate infections. Have fun boys & girls. Sincerely, a retired intel officer….p.s. forgot one thing, be able to think quickly. Don’t think twice, just once and cap the zombie…Plus have plenty of rounds available. I’d prefer not to get too close to a zombie and all the splatter involved with hand tools. Ruger makes a really nice .44 mag rifle with a rotary clip. Buy extra clips and boxes and boxes of mag hollow points. Head shots are the best because once the head is gone, they can’t bite! If you don’t like guns, then I recommend the Japanese style pull saws. Big ones! And go to a Samauri school that will teach you how to use two at a time! Hai! If you don’t run into a zombie, then you haven’t lost anything. The pull saws are great. And don’t forget to check into the rubber gloves and other protective clothing! It’s got to be an axe, double or a maul will do. Of course a bearded axe would be best. Big K, You are right, but sometimes ya got to get up and personal. Ya never know, it may be an in-law. In my case. female/male zombie, they goota go down. Ha!!!! If al fails, by a K-bar..
Actually, my shop would be a great place to be in a zombie attack. heavy duty doors (I dont want my tools stolen, you know!) well stocked first aid kit (in case I lost a finger) our extra freezer with food, not many windows and lots of lumber to board them up, and my shop is FULL OF SHARP OBJECTS!!! All of you guys (that includes both genders because at least one of the followers of Guy Fawkes was a female) have made me so scared that I’m going to spend the entire holiday weekend in my shop, since that is the most vampire proof place I have. It will be several days before I’m convinced that it is safe to leave my shop. I might even find time to pick up all of the junk on the floor. Now, when I explain all of this to my wife, I counting on you to back me up. For distance weapons: M1 Garand with 500 8round clips or M1a with 500 10round mags(I am in California so we are limited to ten round mags), or any sort of AR15 rifle with a decent american 3-9×40 scope and Barnes Varmint Grenade Bullets or my Favorite THE KRISS TDI VECTOR CRB rifle: 75% less recoil than other weapons chambered in 45ACP, no muzzle climb so your follow up shots will be much quicker, I am good out to 200 yards(plenty of distance to take them out and for me to retreat to a different location) every body knows 45ACP big heavy brain obliterating caliber if you are using JHP with nitro in the tip. My second go gun is my Kel Tec KSG shotgun witch holds 15 rounds of 12ga slugs, I’ve been praticing at the local range so I will be good for Zombies out to 2oo yards. My go gear: vest with pockets for my full moon clips for 8 shot revolver, holster attached my vest on left thigh 6 pistol mags for my TRP OPERATOR 1911, right thigh my TRP 1911 and just above on my belt my S&W 327 TRR8 357magnum 8 shot revolver. My go bag:ammo, first aid kit, MREs, water, water purifier, additional clothing, toilet paper, tent, gps, flashlight plenty of batteries, ( I still need to get night vision goggles, radiation pills, full face bio hazard mask) Air freshener would be good too to add cause on Zombieland the zombies can smell that you are taking a dump and try to attack you while you are on the throne. ( That means I will need to so a trap door on the backside of my coveralls so I can get up and run and cloth the flap when I am safely away. Although I have never had a direct zombie attack, I’ve come close at the end of some concerts and festivals I’ve attended. Perhaps a 1 ft, 3/4 inch auger bit for that drill would be a good idea. For the faint of heart who don’t want to get that close to that dastardly zombie, there are extention bits for those augers too that could effectively give you 2-3 feet of distance. Also of course the ever useful second( and fully charged) battery for the drill would be helpful if the zombies are particularly persistant. The last of course is a dream idea personally since when I reach for the second battery it is inevitably uncharged. At any rate good luck with the zombies and other sundry emergencies. I would just show the zombies some of my hand cut dovetails in red oak, stained with (timeless) golden oak stain. The poor execution of my handwork and the dated tackiness of red oak with golden oak stain would surely stop them dead (or undead, or dead again) in their tracks. If that doesn’t work I’ll bring them to the cabinet shop I slave at mon-fri and have them build kitchens with inferior materials, broken tools, very dull chisels, air cleaners that are never turned on because “the over head is too high”, a wide belt sander that makes what ever you put into it worse than it was before you brought it to thickness and two bosses one that can’t order enough materials on time and the other that can’t even run a tape measure, he literally does nothing all day. After a week of that I’m pretty sure the zombie threat would take care of it self. ha! A short history of America’s mighty forests Woodshop Problem-Solving: Now What Do I Do?